Computer Renew Service - 310 Enterprises, Inc.
Is your computer or laptop slower than it used to be even though it's only 1 - 5 years old? Over time, as you install and uninstall software, the system registry and win.ini files become clogged with the remnants of those installations as they are never fully removed. Manually removing them is not the same as reformatting and clean-installing the operating system. Another problem is that there are many programs you may use that can be invasive to your computer (eg: shareware, etc.) and can cause it to slow down. Malware is another factor as to why your computer may be sluggish, but you don't have to take our word for it, click here to read the story. Perhaps you've recently become a ransomware victim or your hard drive crashed. 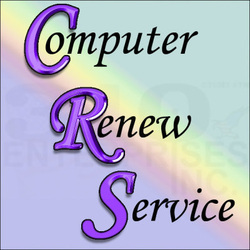 Regardless of the reason, our Renewing service can make your computer better than it was when you purchased it. We offer a FREE alternative if you're tired of Microsoft operating systems, we suggest a Linux operating system such as Ubuntu (more info). Delete old partition and then create new hard drive partition. Install and configure your operating system, we'll need the CDs that came with your computer or laptop. Or we can install a Linux operating system as an alternative (more info). Install and configure motherboard drivers. Enhance monitor resolution for clearer viewing plus expand overall screen size. Enlarge font sizes in all programs so you don't need a magnifying glass to read what is in front of you (something manuals never show you). Install/configure Malwarebytes Anti-Malware and Anti-Exploit to protect your computer from viruses (more info).